Heidi Nelson is from Yucca Valley, California, from “the beautiful Mojave Desert” as she puts it. 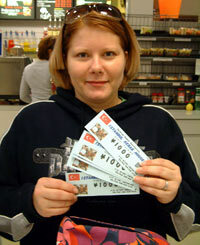 As this week’s winner she will enjoy a great dinner at Kebab Restaurant Istanbul. She has been on Okinawa two and half years and says her time here has been great. On her free time she likes to spend time with her family, Okuma being one of her favorite places. 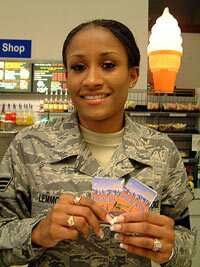 India Lemmon is from Detroit, Michigan, but has lived on Okinawa since 1999. She says she enjoys her life here, and likes to tour the island with her husband and son. She also enjoys bowling and shopping trips. She won \4,000 telephone cards courtesy of KDDI Route K-OK.